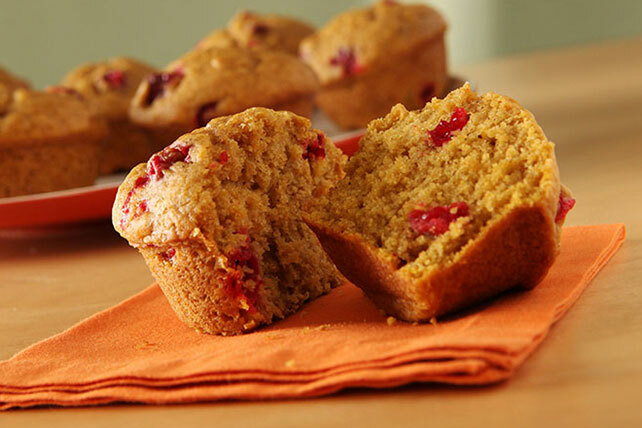 Fresh cranberries, pumpkin pie spice and a surprise ingredient make these muffins super-moist and flavorful. Bake 25 min. or until toothpick inserted in centers comes out clean. Cool in pan 5 min. before removing from pan to serve. Add 1/2 cup chopped PLANTERS Pecans or Walnuts to flour mixture with the cranberries. Store in tightly covered container at room temperature up to 2 days.